As the days get longer and the air already starts to smell of springtime, everybody likes to enjoy themselves outside. To get in shape for summer, the goats here in the mountains like to practise their favorite sport, some kind of hillbilly aerobic, it looks like they have a lot of fun, doesn’t it? It’s another drawing with watercolors in my sketchbook, maybe one day it turns into a painting? Los días cada vez son un poco más largos y el aire empieza ya a oler suavemente a primavera. Esto es el comienzo de la operación biquini de todos los años. Las cabras aquí en la sierra de Madrid están en plena actividad practicando su aerobic montañés. Un dibujo de mi libreta que algún día puede convertirse en un cuadro grande…. Langsam werden die Tage immer laenger und der Fruehling liegt buchstaeblich in der Luft. Das ist jedes Jahr ein Zeichen, mit der Fruehjahrskur zu beginnen, um im Sommer in Form zu sein. Die Ziegen hier in den Bergen bei Madrid sind eifrig dabei, ihren Lieblingssport, das Bockspringen zu ueben: eine Zeichnung aus meinem Skizzenbuch, vielleicht wird ja mal ein Bild daraus….. 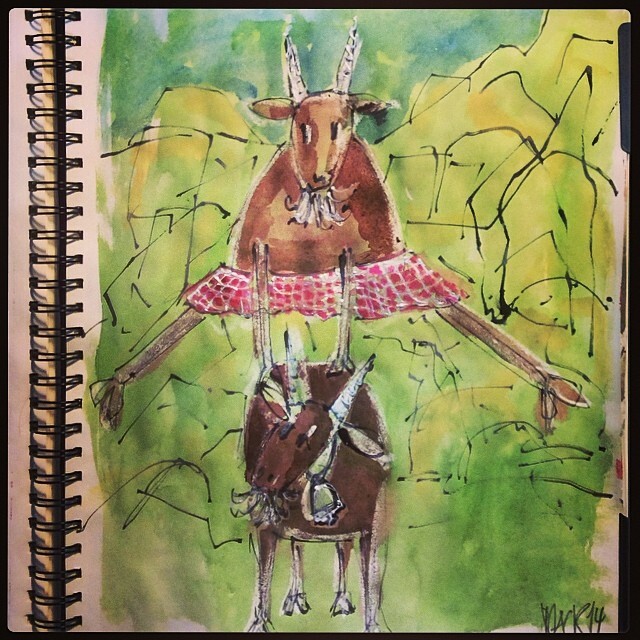 This entry was posted on Thursday, March 13th, 2014 at 11:18 am	and tagged with art, creativity, drawing, fun, sketchbook, water color and posted in a picture a day, animal paintings, drawings, goats, illustration, look at the bright side, mixed media, sketches. You can follow any responses to this entry through the RSS 2.0 feed. This one is hilarious!!! I love it! So creative!